I invite you to follow me on a journey of coincidences, where past and present collide, inspired by a digital scan of a photo my dad gave me…. I went to The Curtis Institute of Music in Philadelphia. Founded by philanthropist Mary Louise Curtis Bok in 1924, I had seen her kind face stare at me from a Norman Rockwell painting as I attended classes there as a student. Later, when I worked in the Library Archives soon after I graduated, I learned much more about her. At the time of my school’s founding, she had been married to another noted Philadelphia philanthropist and businessman, Edward Bok. I also leaned about the Bok Singing Tower – a giant pink marble carillon in Florida. 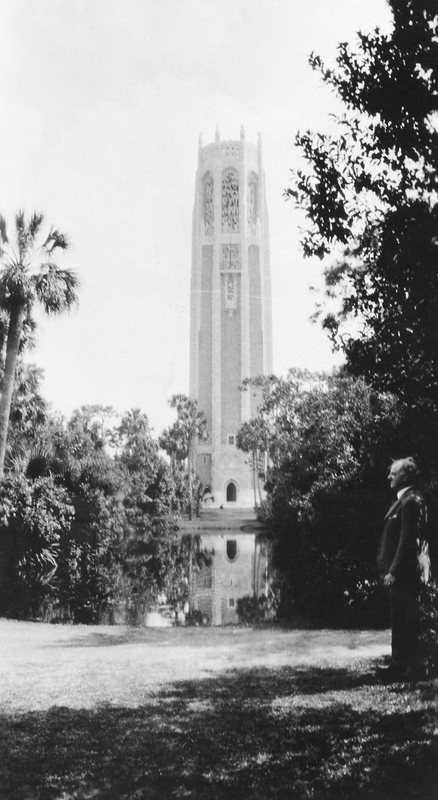 Between 1929-1933, Curtis sent composition students to the Bok Singing Tower at the Mountain Lakes bird sanctuary in Lake Wales, Florida, to study carillon as the guest of the Boks on their estate. In my work in the archives, I saw transcripts for these classes in “campanology” (the study of bells) from composers like Samuel Barber and Gian Carlo Menotti. While at the Singing Tower, Samuel Barber took lessons from carillonneur Anton Brees and composed his Suite for Carillon. The suite was commissioned by Edward Bok. The first and fourth movements were performed by Anton Brees on the carillon at Bok Tower Gardens on April 4th, 1931. 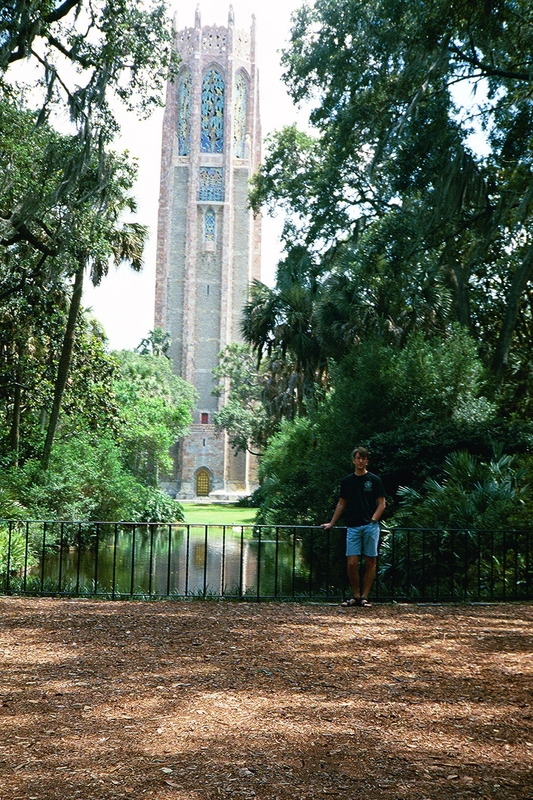 Knowing this, on one of our first trips to Florida (here, in 2000), we were sure to visit the Bok Tower. Folks in Philadelphia seem to have long since forgotten that this relic existed, and I was fascinated to find this Curtis connection 1,000 miles away. Even the ironwork was from the same skilled craftsman who had done Curtis’s – Samuel Yellin. In the photo albums my dad scanned I discovered that between 1925 and 1934, my Great Grandfather Heberle took the family on cruises to Bermuda, Cuba, and the Panama Canal. 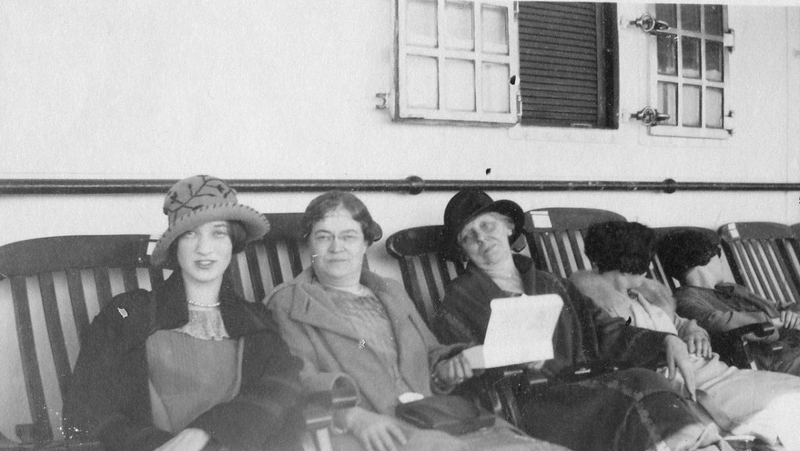 Lucile Heberle (my grandmother), Alma Heberle (her mother), and Julia Welch on the deck of the SS Fort St. George in 1925. Now for the Paul Harvey “The Rest of the Story” twist: On their way to Cuba in 1931, they stopped off in Florida. Here’s my great grandfather, posed in the same spot I’m standing in the first photo in this post. Maybe you missed your calling (not really) and should have been a historian!? This is fascinating! This is fascinating. My great aunt by marriage was Esther Tatnall who was the first woman double bass student at Curtis in 1926. Could they have known each other? Not my grandmother, but she would have known Mary Louise Curtis Bok (the school was very much like a family then). And she would have studied with my teacher’s (Roger Scott) teacher, Torello. How very odd to not only do the same thing but be photographed doing the same thing as your great grandfather. I think your forebears would be surprised to learn that the family no longer goes on Grand Tours, but rather White Trash Tours. Awesome! love the pics of our great grand parents! Actualy the historical records indicate that Great Grandma Alma Heberle took Grandma by herslef one yeart and the following year she took grandma’s sister margeret. but this is still realy cool. been studying the Heberle/Normandeau/Sipling side of the family. Wow – have you been looking at passenger lists? It’d be nice to pin down dates on some of these photos. Thanks! Who’s that young kid in the first picture?